Well, it’s done. 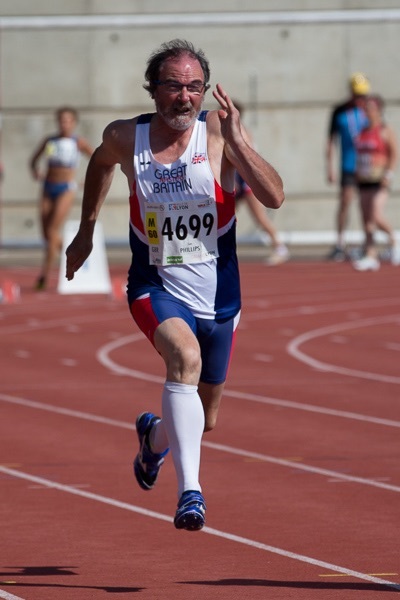 All of my photos from the World Masters Athletics Championships in Lyon, France in August 2015 are now on my web site, and can be viewed here. It’s a long, tiring but nevertheless pretty mindless process editing everything up for publication. It gave me plenty of time to think about my time in Lyon and the role of a photographer there. I’ve already blogged about what it was like for me as an athlete in the Championships. You can read that here. This follow-up piece contains some of my musings on life behind the camera. Lyon was my seventh World Masters Championships event. I’ve covered a whole load of European and national events too, of course, as you can see from my website. However, a palmares like that cut no ice with the Lyon organizing committee, who turned me down for accreditation as a photographer there! 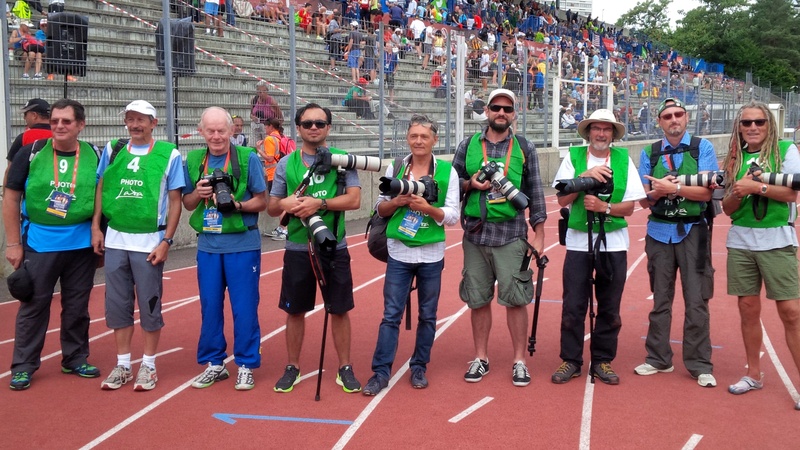 It was only following the intervention of World Masters Athletics Vice President, Margit Jungmann, that I and Doug “Shaggy” Smith, my long-time Canadian trackside partner behind the camera at World events, obtained clearance to work as photographers at the event. Thank you so much, Margit. And work we most certainly did. These Championships were spread over four stadiums and it was simply impossible to cover everything. The multiplicity of venues created timetable nightmares and impossible clashes for many athletes, and also for we snappers. We’ve not yet mastered the art of being in two places at the same time, either. On top of this, Doug and I were in a group of two or three photographers who also took part in the Championships as athletes in our chosen events. I think I was busiest, and raced on five days in Lyon. My reward was also to be the only photographer to come away as a World Champion, as my recent blog reports! Some time back, a Masters web site called me “the fastest cameraman in the world”. I like to think I’ve upheld that title by my exploits in Lyon. These days, I’m much better than I was at giving first priority to my running, and at knowing when to put the camera away, or not even to take it with me to the track. It is so easy to get drawn into the atmosphere of these big events, and suddenly to find that you’ve spent an extra five hours or so on your feet, when you should have been resting up for your next race. Five hours? Hah, that would be good. I made a couple of short days as photographer in Lyon, after narrowly failing to make the final of the 100m and 200m, and there was one day when the published programme of events was kind, too. However, at other times, a ten hour day was common. Bear in mind too, that on several days the Lyon temperature reached 40 degrees C in the shade, and considerably hotter down on the track, where we were shooting the action. At least it didn’t rain on any of the days I worked on the track. 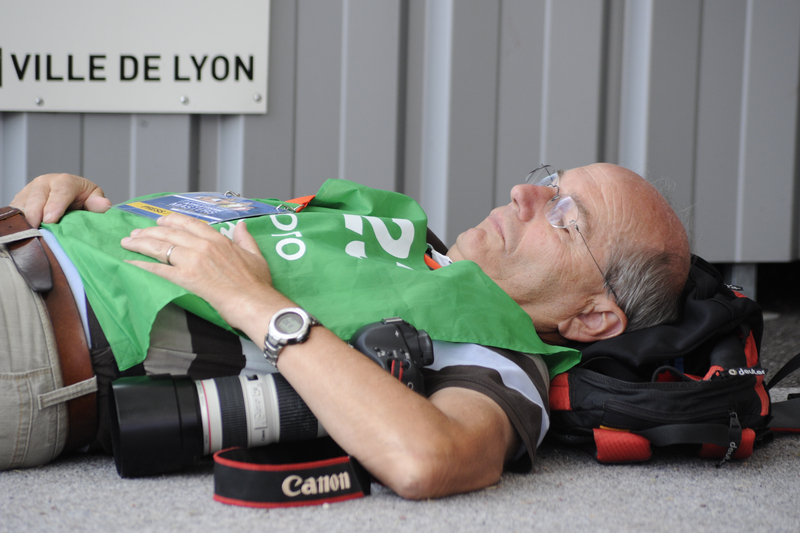 Not me, but a colleague catches some rest in Lyon! I had driven to Lyon, and was staying in a motel quite some way out of the city centre. This had its disadvantages – mainly that my social life was pretty limited every evening for two weeks – but it had the advantage that I didn’t need to carry heavy camera gear across the city on the crowded buses, trams and metro trains. Gear? I took two Nikons, three lenses, plus the usual bundle of accessories. A problem with the mechanism of my long lens meant I had to use it the whole time with a 2x converter attached. I was ultimately glad of this, because I could catch a lot of the action from further away than usual, and had less running about to do. However, it was hopeless for things like group photos, so I was glad of the second camera and a wide lens. Being properly dressed for the conditions, remembering the suncream, and above all, eating and staying properly hydrated are all things you learn from bitter past experience at events like this. We were not really grateful to the Lyon organisers for expecting the accredited photographers to wear bright green nylon bibs, produced in a “one size fits none” shape. However, on the positive side, we had few problems in Lyon that we’ve experienced at past events, of unauthorised photographers getting under our feet. It was also great working alongside a team of track officials who were generally courteous and good-humoured, and, most of the time, respected us as having a job to do and knowing how to do it. We’re not always that fortunate! There were nevertheless the occasional “moments”, as there always are, when action, art and officialdom come together! When it came to deciding which tracks to shoot at, I set a few simple principles. I wasn’t prepared to drive from stadium to stadium all around Lyon to catch action at several different venues on a single day. Time spent navigating Lyon’s roads was time not spent catching the action, of course. I also gave priority to venues that would have a good number of British athletes there, and to venues where finals were taking place. Even so, at one venue I visited for a day, there was so much going on, spread around a large and shade-less site, that I eventually found I was missing more potentially good shots than I was getting. At least the multiple venue approach by the organisers meant these championships were able to finish the schedule every day by early evening. None of the usual late nights, although there were several early starts. As a freelancer, I am fortunate, in one sense at least, not to go to these events burdened with the expectation that I will submit a body of work, reports etc, every afternoon or evening. I pitied those slaving away in the media centre who had to do this, keep web sites up to date, and so on. Apart from catching the best of the action, I needed to ensure that Athletics Weekly magazine got a dozen or so shots from me by the end of each of the two Sundays I was in Lyon. I also made sure I posted a representative selection of photos regularly to Twitter. My iPad served me well as portable technology. The main stadium and the media centre were also supplied with very capable wi-fi, unlike my hotel, where it was slow and sporadic. That same description could be used of the online results service in Lyon. It could be, but to use it would be irresponsibly kind. To be frank, for most of the duration of the Lyon championships, the results service was an utter disaster and a significant black mark against the achievements of the Lyon organisers. Not only was the capacity of the web site used for the results service grossly under-estimated, but it took far too long for the situation to be improved. Far too little information was given out about what was happening to get better results out to the athletes and the world at large, too. One has to hope that the organisers of future events will recognise the web-oriented world in which we live now, and ensure that they prioritise a world championships-class web service. I’m as yet undecided whether I will be going to the 2016 Worlds in Perth, Australia. It’s a long way off, though, and things might change. Sadly, I don’t know who took this shot. Shaggy Smith on the right. Me third from right in the white hat, holding my camera. One of the big problems I find with major competitions is that while you might get to meet the best at actually doing their event, you also encounter the best at talking about it. Sometimes it is the only conversation you get out of them. Conversation? It’s usually one-way stuff! There are many variations to the breed, and I often hear stories from others that make me glad I spend a lot of my time down on the track, photographing the action. I’m a poor spectator, and usually need to be doing something, rather than watching others do something. I can’t always get away from them, even down on the track. The ones that irk me most are those who obsess about consequences. You know. Their story’s usually a variation on: “If I do A and B, C will happen, providing D and E don’t”. They’ve usually managed to filter out the possibility that F, G and H are out of the frame. They’re also invariably wrong, particularly when it’s other people they’re applying their theories to, rather than themselves!, Some can carry this stuff on as part of the post-mortem to a failure. Some have even learned to use the techniques to analyse their successes! No, keep me away from them, please. There are aspects of my own branch of the sport that I find sufficiently mindless that it really doesn’t do me any good to think too much about them. OK, that might be a point I’ve only reached after many years, but it’s nevertheless the case for me. I am regarded as a good starter from the blocks, for example. These days, it is such ingrained technique that in the mili-seconds that follow the gun (they seldom precede it with me; I have a good record for not false-starting), there is just not enough time to lay out a plan and carry out corresponding actions consciously. However good it might be and look, it’s still a mad thrash. I’m well into distraction therapy on race day, so that I don’t have to think too much about it. This was how it was on the day of the sprint relay finals at the World Masters in Lyon (yesterday, as I write this). I did an hour or so’s photography of the adherents to full-immersion baptism, aka “steeplechasers”. This included a trackside incident that reinforces my view it is useful to have us photographers around. A Greek guy had a nasty fall at the water-jump. He spoke only Greek. The paramedic spoke only French. My photo buddy Alex is fortunately fluent in both, and saved the day. I’m sometimes not as good at putting my camera away and getting off to the warm up area as I should be, but I was yesterday. Increasingly, I find a long, slow warm up works best for me (age?) and I gradually built up the effort while avoiding too much conversation, especially with the obsessives. We were a relay foursome who have seldom worked together in the past, and baton change practice was cursory, a) because there was no room in the pathetic warm up space we were given in Lyon’s Duchère stadium, and b) because we had no baton to practice with. We basically just trusted each other’s skill and experience, and reminded ourselves to keep the changes “safe” at all costs. The area in which we were penned up, waiting to race wasn’t unpleasant in the warm sunshine. Had it rained, it would have been hell. There were also virtually no toilet facilities, so I was glad I’d “been before I got there”. Then it was “race on”. Me running the first leg. I ran last leg in a relay a few weeks ago. I could get to like the “glory leg” aspect of winning, but getting overtaken from the lead and throwing away the efforts of three team-mates would never suit me. These days, my fast start serves to help establish us in the race. I had lane 5 on the track. Perfect for me. The bend is gentle, and I can really put the power down. There was a false start from the German guy in lane 2. I’ve learned to go with the gun and only respond to the false-start recall gun, of course, but I saw him getting a yellow warning card, as I walked back to my blocks. That false start was an immense help. I realised I’d got my starting blocks set up perfectly, and if I went off next time as well as I’d just done…. I’m teasing you, of course. There was no such analysis until later. At the time, it’s just focus, focus, focus. Bang! Go. Drive the legs. Pump the arms, Fly! Actually, other than responding the the bang, none of that happened consciously, of course. But a few seconds later, this time I realised I’d got it right big-time. I was almost on the shoulder of the Spaniard in Lane 6, and the French guy in Lane 7 was coming back to me. A few seconds more and I could see Ian, crouched confidently in the acceleration zone before the takeover box. We’d agreed he’d not put his hand back until he was in the box, to avoid a premature changeover. We’d agree he’d go off harder than in practice, and we’d agreed he’d keep to the right of the lane, to allow me to maintain speed and not run into the back of him. So, all I had to do was watch for his hand, and put the baton there. It really was that simple. Ian shot off, Alastair took over from him, and Steve, although worryingly in pain from an achilles injury, did his usually star turn on the glory leg. We won. We were World Champions. It really was that simple. (Hah, hah!). I knew I’d run well. Others kept telling me. Other people can be kind, of course, but so many told me this time, that there was a real chance they (and I) were right. It was only several hours later that someone told me about the online report by Athletics Weekly magazine, which referred to my “spectacular ” lead-off leg. I can live with that. Job done. I’ve been out at the World Masters Athletics Championships in Lyon, France, for ten days now. My apologies I’ve not blogged. My time is so taken up at events like this either racing, preparing to race, recovering from racing, travelling between hotel and track, photographing, or editing the photographs (and so on, and on….) that it’s hard enough to fit in meal times, let alone writing! However, today is a rest day, while the World Masters Athletics Council big-wigs meet to decide how many angels would fit on the head of a pin, and where the 2018 World Championships will be held. I’ve done my one and only proper piece of touristing in Lyon this morning (too full of athletes I’ve been seeing all week), I’ve restocked for lunches for the last three days of the Championships, Now, tea and French doughnut (beignet) in hand, I’m reflecting. I had a delightful few days driving out to Lyon, but I arrived at the same time as the start of a heatwave. Normal local temperatures at this time of year (early August) are around 26-28C. We began getting 35-38C. On the third day of the Championships, I had my heats of the 100 metres. Fortunately these were early in the day, but already in quite intense heat. Warm up facilities for athletes were, as so often, inadequate and overcrowded, but I ran well, very nearly won my qualifying heat, and advanced to the semi-finals next day. By “ran well” I mean season’s best, superb start and pick up, and general feeling of wellbeing. That next day was a bit of a case of “eat, sleep, repeat” and I was again on track at 10.30am. Making it to this semi-final had been one of my targets for the year, but I was in with a sniff of the final now, if I excelled. I didn’t quite. I missed making the cut for the final overall by just two places, putting me tenth fastest overall. Well, I’ll take top ten at the Worlds, thank you very much, and I picked up my cameras to get stuck in to shooting the rest of the day’s events. It hit a recorded 40C in the early afternoon, and almost certainly got hotter later. I drank, and drank, and drank. About 12 litres of water, a flask of tea, and a cold beer. By close of play around 6.30pm I was done for, but at least I had the first of the Championships rest days to regather my composure during Saturday, next day, before reporting to run in the 200 metres heats on Sunday. I attempted a little token touristing next day, but as my hotel is an hour from the local transport systems, it was a long walk to start with, on already tired feet. After not all that long, I headed back, just as the heavens opened, and temperatures plummeted. I’d say I was soaked to the very bones when I reached the hotel again. And worse, by mid-evening, I was sure I had caught something, or that the volume of liquid I’d had to consume the previous day had severely compromised my system. I’ll spare you the details, but when the 5.30am alarm sounded on Sunday, I was a wreck. Breakfast was tea and Immodium, and the 200 metres heats were at 10am in very humid conditions after the heat and the rain, which had continued all night. By some miracle, I got second place in my qualifying heat again, and gained a place in Monday morning’s semi-final. And, with that, the second of my two targets for the year was also in the bag. I headed back to the hotel, a drive of about twenty minutes. I got there before, shall we say, a full system collapse. The expression “both ends burning” might convey it enough. I died several deaths in my bed, and gave in to this ill-timed sickness. I ate no food, and could manage only occasional sips of water. I don’t recall a lot more. Eventually, I slept dreamless sleep. Good job I had left the 5.30am alarm in place. When it woke me on Monday morning, I felt drained and dreadful, but duty demanded that I at least report for the 200 metres semis a few hours later. All the subsequent preparation, travel, and warming up stuff at the track used auto-pilot. Although I’ve probably had a better year at 100 metres this year, I still love running 200 metres races. I’d done a long, slow warm-up and when we were walked half of the way around the track to the start, in what was very “British” weather, I may have felt physically empty, but mentally, I was relaxed and prepared. Don’t ask me how. I flew from the gun. The bend was possibly my best ever. As I hit the straight, I distinctly heard the stadium announcer say “And it’s Tom Phillips of Great Britain and Northern Ireland with a good lead as the athletes come off the bend.” I relaxed slightly at this point, without allowing my speed to drop, as one needs to do in a 200m race, and with about 60 metres remaining, I groped for top gear. But it was gone. Three others came past me as the race ended, and my fourth place was just short of what I needed for a slot in the final. I wasn’t really surprised. Just to be there after the trauma of the previous 24 hours was remarkable enough. And it had ended, too. I suddenly felt ravenously hungry. A supermarket quite near the stadium met my needs fully. I’d run a 2015 season’s best outdoors, too. The body is a truly strange thing. Well, mine is, at least. Oh, and I achieved another ambition in the 100 metres in Lyon. Photos of me racing are rare. Photos of me running well are rarer still. However, my friend and fellow photographer Alex Rotas got several shots of me from trackside that are, to me, just perfect! I’ve added one to this blog. Thank you so much, Alex. More from Lyon before I go home. You are currently browsing the Blog from a Faster Master blog archives for August, 2015.